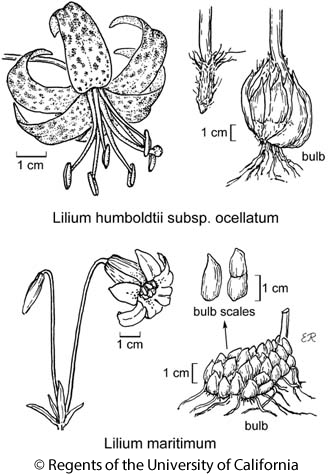 Habit: Plant from bulb-like, scaly rhizomes (called bulbs here for brevity), generally not clonal, +- glabrous; bulb scale segments 2--many, if segmented. Stem: erect. Leaf: > 12, +- whorled (often some alternate), sessile, spreading with drooping tips to ascending, generally +- elliptic; veins generally 3; stipule 0. Inflorescence: flowers axillary, 1--40+; bracts generally 2 per flower. Flower: generally radial, generally bell- or funnel-shaped; perianth parts 6 in 2 petal-like whorls, +- lanceolate, base narrowed, generally red-purple-spotted adaxially; stamens 6, gen exceeding to much exceeding perianth, anthers attached at middle (measures are after dehiscence); style 1, stigma 3-lobed. Fruit: capsule, erect, generally +- smooth, loculicidal. Seed: many, flat, in 6 stacks. Chromosomes: n=12. Species In Genus: +- 100 species: northern temperate, tropical mountains of eastern Asia. Etymology: (Greek: lily) Note: Variable, hybridization common. Many species declining from habitat destruction, collecting; few thrive in gardens. Generally flowers May--Aug. Habit: Plant < 2.5 m (< 0.3 m on coastal bluffs); bulb +- spreading-elongate, lumpy, scales 1(2)-segmented, longest 1.5--4 cm. Leaf: basal, alternate, or in 1--3 whorls, 3--18 cm, narrow or not; margin not wavy. Inflorescence: flowers 1--13, nodding (spreading). Flower: bell-shaped, not fragrant; perianth parts 3.4--5 cm, elliptic, reflexed or rolled in distal 20--50%, red or red-orange, darker spots concentrated mid-basally, surrounded by light orange (or yellow-green); stamens held at same level as perianth, filaments +- parallel, anthers 4--12 mm, light magenta, pollen orange; pistil 2.2--3.2 cm. Fruit: 2.4--4.1 cm. Ecology: Coastal prairie or scrub, peatland, gaps in closed-cone-pine forest; Elevation: < 150 m. Bioregional Distribution: s NCo, n CCo. Flowering Time: May--Jul Note: Hybridizes with Lilium pardalinum subsp. pardalinum. Citation for this treatment: Mark W. Skinner 2012, Lilium maritimum, in Jepson Flora Project (eds.) Jepson eFlora, http://ucjeps.berkeley.edu/eflora/eflora_display.php?tid=30942, accessed on April 24, 2019.
s NCo, n CCo. Markers link to CCH specimen records. Yellow markers indicate records that may provide evidence for eFlora range revision or may have georeferencing or identification issues. Purple markers indicate specimens collected from a garden, greenhouse, or other non-wild location.